the Tewa pueblo called San IIdefonso Puelbo, located near Santa Fe, New Mexico. He comes come from a long line of famous Tewa pottery makers. His great grandmother was Maria Martinez, which has become a name synonymous with Native American Pottery. a life long resident of San IIdefonso Puelbo, located near Santa Fe, New Mexico. and other well known Pueblo painters. I tried to imitate their styes and eventually evolved my own style and or styles. 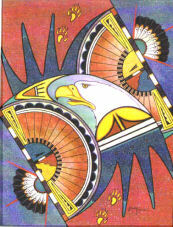 I paint very traditional Pueblo de San Ildefonso style motifs to very abstract and non-traditional type Native American Art." After Jerome graduated from High School he began using color and original designs and actually taught himself how to paint. 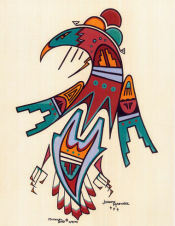 Today, he is a sought after painter with unique, beautiful, peaceful designs.